No problem! 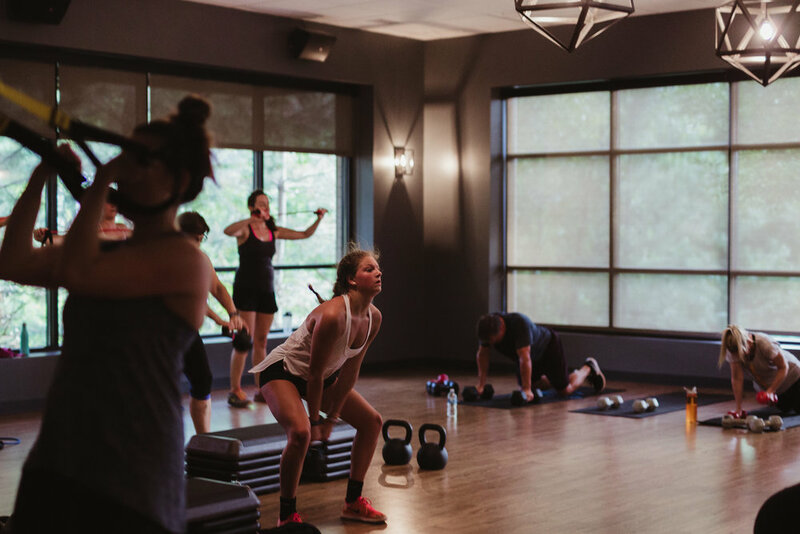 Whether you're a dedicated student or looking to start moving again, we've got a class for you. All of our classes are all levels. Check out our class cheat sheet to help find what you're looking for. Detailed information about all classes, including what to bring and what to expect, can be found below the cheat sheet. No mat? No problem. We have yoga mats + towels available to rent. What it is: a heated, Vinyasa-style yoga class that matches breath with movement. All Levels: some yoga experience encouraged, but not required. What You Need: water, towel + yoga mat. This class moves at a moderate to fast pace. What it is: a music-driven Power Yoga class that incorporates small muscle-toning movements into each flow (no weights and no high impact movements). It's what we believe to be the perfect class: 80% yoga for flexibility + muscle lengthening, 20% strength for challenge + muscle toning. What it is: a slower-paced, less heated Power Yoga class that allows you to both challenge your body and chill out your mind. What it is: a very heated, 60 minute class that follows the Bikram Yoga posture sequence (read: you practice the same postures in the same order every class). This class is seasonal - please check the online schedule. All Levels: some yoga experience encouraged, but not required. This is a great class for beginners if you don't mind the heat - all postures can be modified or advanced. What You Need: lots of water, towel + yoga mat. This class is beginner friendly, but it is very hot – if you’ve never practiced in a hot room before, we recommend taking Power or Candlelight Yoga first. What it is: 75 minutes of Power, Yin and Restorative Yoga. You’ll move through a 45 minute Power Yoga sequence, followed by 15 minutes of Yin Yoga (deep, intense stretching), and close out your practice with 15 minutes of Restorative asana. This is a good option for beginners, but some yoga experience is encouraged. What it is: The first half of the class focuses on gently warming the body with a combination of dynamic stretching and an all-levels yoga flow that links breath with movement. The last half of the class will focus on stretching, recovery, and myofascial release for deep-held tension. All Levels: No yoga experience needed. Great for those with active lifestyles (runners, golfers) and also for those who are looking to start exploring movement and mobility but are not yet ready to take on a full yoga class. This is a great option for beginners. What it is: a sweaty, music-driven, total body cardio + strength workout that combines yoga postures and free weights. All Levels: no yoga experience needed. Please note that class is heated, and while intense, all postures and exercises can be modified or advanced. This class is beginner friendly, but previous yoga experience is encouraged. What it is: a high-intensity, total body workout that incorporates circuit-style training with tabata strength + cardio intervals. Workouts change every day, which means your body will, too. All Levels: while challenging, all exercises can be modified or advanced depending on your fitness level, and all exercises are taken at the student's own pace. This class is challenging, but all exercises can be modified and taken at your own pace. What it is: an hour-long workout that completely exhausts every muscle in your body – both big and small. Our take on the traditionally disciplined format incorporates cardio bursts to up your calorie burn. All Levels: while challenging, Barre is low-impact on your joints, making it a great workout for all fitness levels and abilities. What You Need: towel + water - we have barre mats for you to use. No shoes! This is a great class for beginners and all fitness levels. What it is: the best hour of your day disguised as a seriously killer workout with absolutely no judgement, for the wannabe (or actual) dancer in all of us. All Levels: no dance experience necessary (we promise). Every move can be modified depending on your fitness level. What You Need: water, towel + clean athletic shoes (no dark soles, please!). You can be barefoot, too! This is a great class for beginners – no dance experience is needed! What it is: a fast-paced, music driven dance workout. Soul is a fusion of cardio, dance, yoga, toning + plyometric movements and is a full body, super sweaty, super fun class.